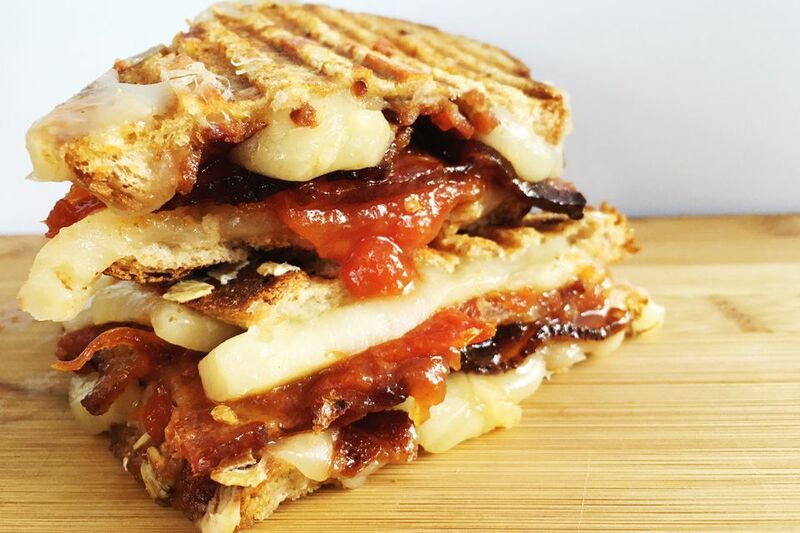 Crispy bacon, melted sharp white cheddar, and a sweet and smokey homemade tomato jam make this grilled cheese sandwich extra delicious. Afraid of making tomato jam? Don't be! This recipe is a super easy no brainer that anyone could do! Add the tomatoes, sugar, lemon juice, ginger, cumin, cinnamon, curry powder and salt to a stainless steal pot and turn the heat to medium-high. Once the mixture begins to boil, reduce the heat to medium-low and continue to simmer, stirring often, until the mixture reduces and thickens into a jam like consistency; about 1 hour. Add half of the white cheddar to one slice of the multigrain bread and top with the tomato jam. Add the bacon on top of that and then add the rest of the cheese and the remaining piece of multigrain bread. Add your buttered sandwich to a cast iron skillet or panini press, and turn the heat to medium-high. Grill the sandwich for a few minutes until the bread crisps up and the cheese starts to melt. When one side is golden brown, gently flip the sandwich and let the other side cook until it's crisped up and all the cheese has melted. Remove from heat and let cool for 1 minute before slicing so that the cheese doesn't ooze out all at once.